It’s been a long winter, and it doesn’t feel like I’ve listed a lot of birds yet, beyond the usual suspects, but apparently I’ve had my best first quarter since beginning my annual lists. Last year I added several when I went to Maryland, but this year, I added only one on my visit. My brief forays to Portland early in the year got me some water birds. Here’s what I’ve got so far: downy woodpecker, house finch, white-breasted nuthatch, tufted titmouse, mourning dove, Carolina wren, American crow, mallard, rock pigeon, red-tailed hawk, turkey vulture, herring gull, great black-backed gull, European starling, red-breasted merganser, common eider, common loon, long-tailed duck, bufflehead, common goldeneye, black scoter, northern mockingbird, great black hawk (the rarity whom I got to see for the second time just 27 days before it died, and yes, its death was heartbreaking), harlequin duck, wild turkey, Canada goose, hairy woodpecker, great blue heron, northern flicker, blue jay, northern cardinal, black-capped chickadee, red-bellied woodpecker, American goldfinch, dark-eyed junco, house sparrow, white-throated sparrow, American robin, common raven, pine grosbeak (my first ever), cedar waxwing, bald eagle, rough-legged hawk, northern harrier, pileated woodpecker, barred owl, hooded merganser, common redpoll, eastern bluebird, snow bunting, red-winged blackbird, killdeer, belted kingfisher, wood duck, song sparrow, black duck, American kestrel, fish crow, black vulture, eastern phoebe, common grackle. I’m worried that I won’t see a snowy owl this year—that 2019 is the year that my snowy luck runs out. I’ve had this worry before. In 2017, I listed one just under the wire: Christmas Eve. It’s not that by 2016 I was expecting to see one, but when I at last found one in November, I had to admit that I was getting used to being able to find them. When November 2017 passed without a sighting, I was pretty sure my luck had run out, but December 24 was our day. We saw another four weeks later, in 2018. And here it is the end of March. I didn’t see any of the owls that came through at the end of last year, and I haven’t seen one to count yet this year, so now, if I get one, it will be at the end of the year, if it happens at all. After a five-year listing run, this could be the year I don’t see a snowy owl. In other news, the red-winged blackbirds are back. My birthday isn’t until the weekend, but yesterday I was at the gym that has a big classroom, and no one was in it, and the lights were out, so I got off the treadmill and went into said classroom and did three cartwheels—because there is space and because if it turned out that this is the year I can’t do a cartwheel, someone would find my broken body fairly quickly—but the cartwheels were fine, that is, they felt fine, I’m sure they weren’t perfect or gorgeous, and I haven’t attempted one since last year, and I was in fact worried about this year because I haven’t been to the gym enough to keep up what little weight resistance/lifting I do with my arms and I haven’t been keeping up with yoga so I’ve barelyrarely been supporting my own weight and my arms are starting to look like old-lady arms—still, it made me happy to do the cartwheels, but because I did them before my birthday I’m not sure they can count as my birthday cartwheel as I think I have to turn the next number first, so the question again becomes where can I conveniently and safely attempt my birthday cartwheel as there are few readily available indoor spaces and outside is hard, dangerous ice? Gets harder in the winter, gotta be a fake or shiver. It takes a great deal out of me.
. . . I wanna go out but I wanna stay home. I spend a lot of time alone. I like being alone, until I want to not be alone—that moment when the content feeling of solitude shifts to an anxious one of isolation. Especially in winter, when I suddenly I realize I haven’t seen my neighbors, as we’re all hunkered down, hiding from the cold and the dark. Hibernating. I realize I haven’t gone out and done anything. I want to. But I don’t want to. We need to prod one another. Sometimes we do. It’s good. But it’s hard to feel inspired. It’s hard to stay in and start projects. It’s hard to go out and see friends. I am not overly busy with friends, but I am not getting anything accomplished beyond maintenance. I am watching dark comedy on Netflix. I am in bed early, reading. I am getting nothing done. The days are getting longer, but they are still short, and so cold. I think I’ve been drinking too much. Far from having a dry January—people do this, and it sounds like an interesting exercise—I have been having a very wet one. I love having happy hour when Tim gets home. But once I get a little happy, I want to get more happy. January is tough, and this one has been, in part because we discovered early in the month that Tim needed to have two wisdom teeth out, and he couldn’t get an appointment to have it done until the 29th, so for three weeks or so he had to live with what was going on. He took antibiotics, it got better, but it couldn’t have been fun. Getting calories was an adventure. Less than 48 hours ago—and driving 47 miles each way in a snowstorm—he got the two teeth extracted. He seems to be doing very well. One of the ways he was self-medicating, besides the massive ibuprofen, was good old-fashioned alcohol. Turns out that because he’s not taking the real painkillers postsurgery, alcohol is not contraindicated during his recovery. So it was back to happy hour again last night. In the January isolation, I am like a happy puppy when Tim gets home, ready for jazz in Martini Lounge and a Vesper with a twist. Winter can be isolating. Some isolation is choice. Some is not. Sometimes one may find oneself choosing isolation and not choosing it at the same time. The January weather has been challenging. Deep cold. A weekend snowstorm dumping fabulous, x-country-skiable snow, but the temperatures so low and the wind chill so high that venturing out was impossible for me. This was immediately followed by a 50-degree warming that brought lots of rain, which of course produced flooding here and there. Lots of water falling on 18 inches of snow and ice. Good times. Often I refuse to leave the house. But yesterday, after about 5 inches of snow the night before, after I went out to shovel enough to get cars out, I saw that I had a window to ski. The sun was out and would be for a few more hours. The temperature was in the teens. There was no wind to speak of. So out I went, onto the rail trail and into the fluffy stuff. There was just enough snow cover on the icy base. I was the first and the only one out there. Sunshine. Exercise. I hope it happens again. On December 14, I got some cash for the weekend, added it to what was in my wallet, counted it all: $153. On January 3, in Portland, I logged into a work project, logged out, and time spent was 1 hour, 53 minutes. Amazingly, it happened again the next day. 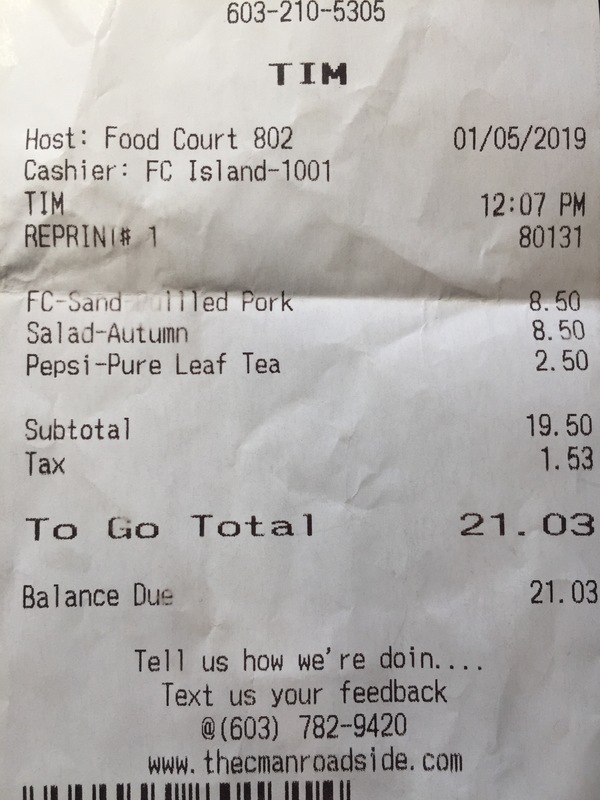 On January 5, at the rest stop on the way home from Portland, tax on our food totaled $1.53 (see photo). 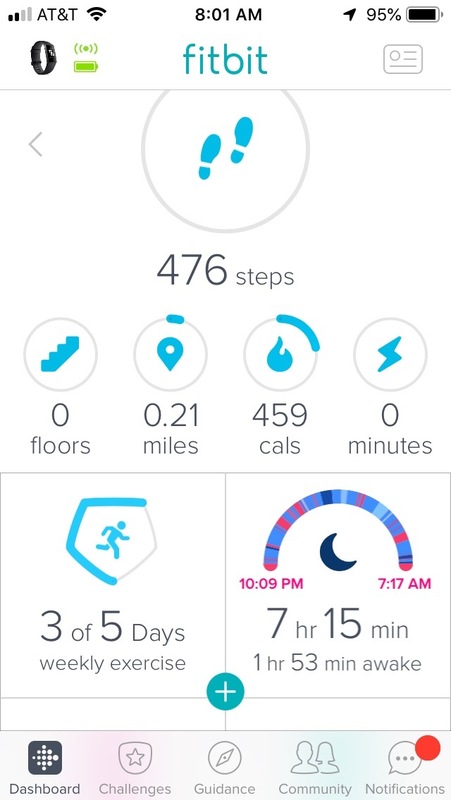 Yesterday, because I had insomnia the night before, I checked my Fitbit to see how the app tracked my sleep. Of the 7 hours, 15 minutes I was “sleeping,” I allegedly spent 1 hour, 53 minutes of that awake (see screen shot). I can guarantee you that at best, I was asleep only 1 hour, 53 minutes. If that. It as if the birds know it is January 1. The annual species count rolls back to zero. Black-capped chickadees refuse to show themselves at the feeder, as do goldfinches and two species of daily visiting woodpecker. At least, they don’t show up before you’re on the road again, trying to bird from the fast-moving car in backlit conditions, thinking “some sort of hawk” or “some sort of gull” or “were those turkeys?” Can’t list a maybe. Even early on the 2nd at the bakery next door, the permanent-fixture-please-feed-me-those-flaky-crumbs house sparrows are nowhere to be seen. On December 31, I hope it is safe to say that I will not be spending any more nights away from home this year, but without question, this is the year I have spent more nights away than ever. I wish I could say that it’s because I am a world traveler or because I have a high-powered, well-paying job that requires such things, but neither of these is true. In 2018, I spent 91 nights away from my own bed. A quarter of the year. January: I went to my parents’ home (my hometown) in Maryland to see for myself what the hell was happening there. Three nights in Maryland proper, staying with high-school-BFF Sue at her mother’s house. Sue lives conveniently halfway between Route 153 and the town where we grew up. I broke up the trip by staying the night at her house on both ends. At the very end of the month, I went with Tim to Portland, a trip that straddled the month change. So, two nights New Jersey, three nights Maryland, three nights Maine (month total: 8). February: Finished out that Portland trip. Headed back to Maryland with my sister to begin the long slog of horrificness. Stayed at a beautiful writer’s retreat through airbnb. Sue let us break up the drive again. Two nights Maine, two nights New Jersey, five nights Maryland (month total: 9). March: Trip to Maryland with Tim to get parents settled in a new situation. Broke up drive on way down by staying at his mother’s in Pennsylvania. At the end of the month, made a wonderfully selfish trip to Kim’s (also in Pennsylvania) to attend a kd Lang concert at the Beacon. Three nights Pennsylvania, four nights Maryland (month total: 7). April: Another trip to Portland with Tim. Dad worsened, so immediate trip to Maryland, during which he died. On the last day of the month, drove to a resort in Vermont where Tim was working to see it and him. Five nights Maine, seven nights Maryland, one night Vermont (month total: 13). May: A previously planned trip to Maryland for two weddings, which ended up including my father’s memorial. The two-weddings-and-a-funeral trip. Did a work thing in NYC on the front end and Sue let us stay with her. Stayed at my sister-in-law’s boyfriend’s house to visit them and attend Emily and Will’s wedding. Drove up to Pennsylvania for a one-night to visit Tim’s mom and her husband. Drove back to an airbnb to be home for dad’s memorial service, but had to move to a hotel for the night of Angela and Joe’s wedding. Later in the month, went to Portland with Tim. One night New Jersey, eight nights Maryland, one night Pennsylvania, three nights Maine (month total: 13). June: My sister-in-law flew to Vermont for a Decemberists concert; we met her and spent the night. My sister and I headed back to a Maryland airbnb via Sue’s for a frustrating trip trying to work with my mother. We then headed to West Virginia for a night at her best-friend-from-elementary-school’s place. One night Vermont, one night New Jersey, five nights Maryland, one night West Virginia (month total: 8). July: Broke up the drive home from West Virginia at Sue’s. Went to Rhode Island to see the shore from my cousin’s house, attend a concert at the early music festival, and find the cemetery where my mother expects to be buried. Went to Portland (where I got to go to a Courtney Barnett concert!). One night New Jersey, three nights Rhode Island, four nights Maine (month total: 8). August: You won’t believe this, but I took a pleasure trip. Sue, Jim, Tim, and I went to Bloomington, Indiana, to see Hoagy’s musical about his father. We stayed with my friend Esther. This may not sound like a destination vacation, but it was the second time I’d spent time there, and it was great. And it had nothing to do with my parents or about anything other than having fun. Four nights in Indiana (month total: 4). September: I spent a night in New York City for a work event. I went to a lodge in the Adirondacks with a bunch of guys Tim works with so that I could go fishing and be in the Adirondacks. Three nights in New York (month total: 3). October: Tim and I went to New York City to attend a play that Sue was producing at the fringe festival. We met newlyweds Joe and Angela there for dinner that night. My sister and I flew to Maryland to check in on the situation. On Halloween, I abandoned my candy post to join Tim at his photo shoot at White Pine Camp on Osgood Pond, because it was the pond I had spent twenty-two summers on before the lodge we went to was sold. Three nights New York, two nights Maryland (month total: 5). November: I spent one more night at White Pine Camp. I went to Portland twice with Tim: once for four nights, once for three. One night New York, seven nights Maine (month total: 8). December: Tim and I visited my mother in Maryland (staying at a hotel, of course). We went to his mother’s for Christmas eve and day. Upon arrival home, I did a quick turnaround and drove to friend Susan’s (in Vermont), traveling with her and her friend to Hartford, Connecticut, to see Hamilton and almost running out of gas around midnight on the way back to Susan’s after the show. Two nights Maryland, two nights Pennsylvania, one night Vermont (month total: 5). I’m exhausted just reading this and don’t expect you to have made it this far. But this explains, in part, where I’ve been all year. Why I’ve been absent from Route 153. This, and the fact that I was working on a 365 blog for 2018, finished today. Many of you know that, as you were right there with me. And now that it’s over, I’ll be back here.